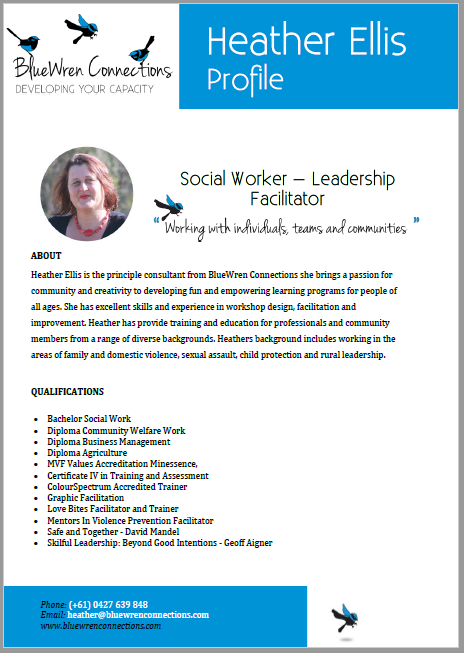 Heather is a community leader, social worker and changemaker driven by her creativity, energy and collaborative spirit. When Heather Ellis left farming 15 years ago to go to University as a mature student she discovered life has more to offer than she’d dreamed of. As the Founder and Principal Consultant at BlueWren Connections, Heather brings a passion for community and creativity to developing fun and empowering learning programs for people of all ages. Click here to view Heather’s qualifications and experience or connect with Heather via LinkedIn. Pamela McAllister from McAllister Leadership partners with BlueWren Connections to enhance our Leadership Connections program. Pamela specialises in the design and delivery of learning programs, coaching and facilitating to assist others to achieve the things that really matter to them. She aids organisations to create productive workplaces where people enjoy contributing their best. For the past twenty years, Pamela has worked across regional and urban areas in Australia to build the confidence and skills of people in business, government and community sectors. She has upskilled people as they learn to lead themselves and others. Pamela has a deep knowledge, respect and aspiration for people on the land and in regions and understands their challenges and needs. Susan loves creating infrastructure. She uses this passion to write, design and implement projects for BlueWren Connections and others. Her goal is to facilitate solid connections with people, ideas and information. Susan solves problems by seeking ideal solutions through communication and technology. Since completing her bachelor’s degree in Leadership and Service in the USA, Susan has contributed to the anti-violence, pet, and mental health sectors in Queensland. Susan wishes to leave a legacy of creating systemic change that improves lives. Debbie Atkins has over 20 years of experience offering training courses in leadership development, project management and group facilitation. She has worked for the Queensland Department of Primary Industries, Western Sydney University and Irrigation Australia. Debbie currently works as a consultant. Debbie has expertise in program delivery and design for large and small groups. Her project management roles with research organisations, universities, membership associations and vocational training has given her a broad range of competencies in developing processes to achieve short and long term project goals. Debbie has held several leadership roles in professional and community capacities and enjoys working with groups. Connor Ellis is a Bachelor of Business student at the Queensland University of Technology and contributes his knowledge to BlueWren Connections on a part-time basis. He holds a Diploma of Business and a Certificate 4 in fitness. Connor is a graduate of Brisbane State High School where he was a founding player in their First 15 Rugby. In his spare time, Connor enjoys playing gridiron (American football) for the Bayside Ravens and has achieved success at the state and national levels.